This AMT/Ertl model is 18 inches long and is in 1/1400 scale. 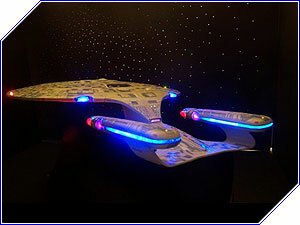 This model can be built, painted and/or fully lit to look exactly as it did in the 'Star Trek: The Next Generation' television show and movies. Full Aztec paneling will be applied, in the authentic colors or custom colors. Approximately 70% of the windows are drilled out and will be lit along with blinking formation lights, navigation lights, and unique spotlights, if desired by the customer.